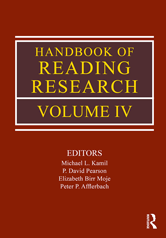 The Handbook of Reading Research is the research Handbook for the field. Each volume has come to define the field for the period of time it covers. Volume IV follows in this tradition. The editors extensively reviewed the reading research literature since the publication of Volume III in 2000, as portrayed in a wide array of research and practitioner-based journals and books, to identify the themes and topics covered. As in previous volumes, the focus is on reading research, rather than a range of literate practices. When taken as a set, the four volumes provide a definitive history of reading research. Volume IV brings the field authoritatively and comprehensively up-to-date.